Flat Roof Repair — Is Replacement My Only Option? 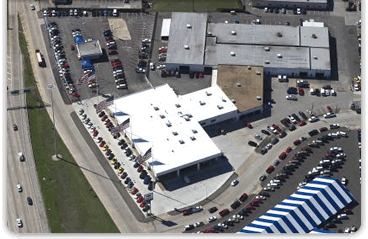 Let’s talk about flat roof repair at your business. Imagine this very realistic situation. You open the door of your business and walk in for another busy day of work. You have a lot to do and a lot on your mind. You notice that you stepped in something wet as you crossed the floor to your workstation. Remembering it rained last night, it sinks in that you’re standing in a puddle of water. Already acknowledging the inevitable, you look up and see the damp and dripping ceiling. You easily imagine the drenched insulation and extensive damage you can’t see on the other side of the ceiling tiles. You know you can no longer put off doing something about that leaky roof. The overall cost of replacing your damaged and leaking commercial roof is going to be really expensive. You have insurance, but it will not likely cover the entire cost of a replacement, meaning a huge out-of-pocket payment. You’re going to lose even more time and money because you’ll likely have to close your business while the roof is replaced. But maybe there are better options for flat roof repair that won’t cost as much time and money as an all-out replacement. An SPF roofing system is a sprayed insulating foam plastic that is applied as a liquid, then expands to many times its original volume. Essentially, it forms a new roof installed over your already existing system. SPF is the highest performing material available, combining durability with insulation, and has a 50-year history of proven effectiveness. Versatility — Can be applied to almost any existing roofing system since it is applied as a sprayed liquid. There is no need to remove your existing roofing materials, even if they are failing and leaky. 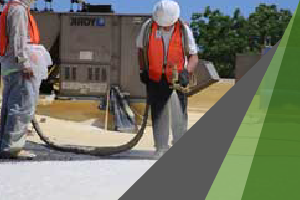 Increased insulation — SPF roofing systems are great for commercial buildings where keeping employees cool under high temperatures is a must. Strength — Can withstand hurricane-force winds and is waterproof, chemically bonding to your existing roof. Cost-effectiveness — All these advantages add up to a 50% reduction in total cost over its lifespan. Hands down, it’s one of the best values for flat roof repair at your place of business. Like SPF, it is applied as a liquid and will not require costly closing of your business. Quite simply, it solves the problem at the source by filling in the cracks and seams of your roof with durable silicone material. Take a look at the The GE Enduris™ Silicone Roof Coating System. This roofing system provides a seamless barrier to the weather, repairing your existing leaks and protecting against future damage and costly repairs. 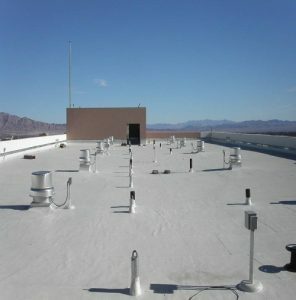 It’s light weight, highly reflective, and fills in the dozens or hundreds of seams and weak areas of your existing roof. 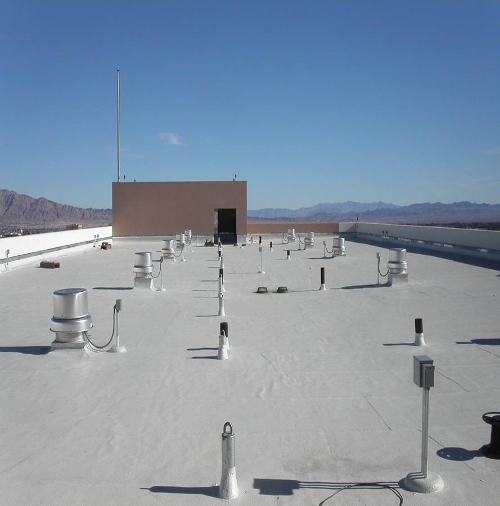 Installation of silicone roofing systems costs less than the average roofing system and extends the life of your existing commercial roof by up to 20 years. Not to mention GE provides a warranty of up to 20 years to back that claim up (Download this PDF to find out more). 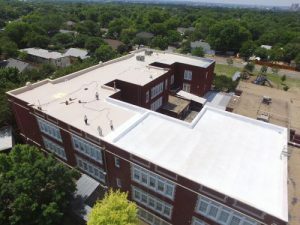 One important point — the silicone roofing system is a durable, high-solid silicone elastomeric coating with great reflectivity. If your roof has drainage issues or ponds a lot of water, the sprayed polyurethane foam (SPF) roof may be your best option. The SPF roof will also provide added insulation — in some cases it can lower your utility bill by 20–30%, which means you could pay for the roof in 6 to 7 years! At DFW Urethane, we have options for you. Replacement isn’t your only option for an aging TPO roof or other leaky commercial roofing system. We meet more and more insurance companies who recommend elastomeric coating for lightly damaged roofs. If this is your situation, you should consider the The GE Enduris™ Silicone Roof Coating System or the Eversil 100 — both are excellent silicone roof coatings. 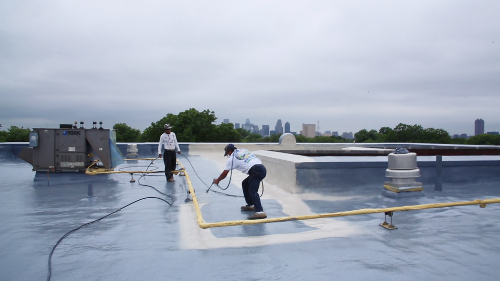 At DFW Urethane, we feel these could be the best coatings in the country for repairing mod-bit, TPO, metal, and other smooth-surface roofs with seam problems. Get in touch with us for a quote or if you have questions about our available solutions for your specific flat roof repair situation.